Zara Levina was born in the Ukraine and lived through the Soviet Union's slaughters and upheavals. It seems that she was well thought of by Oistrakh, Grinberg and Knushevitsky. She died in Moscow. Her music is not completely new to CD. There was a Russian Disc volume issued in 1994 that included her Piano Concerto No. 2 and Poem for Viola and Piano. That version of the Piano Concerto had Boris Petrushansky as soloist and the conductor was Veronika Dudarova. I read that her First Violin Sonata (1928) was recorded by Oistrakh. There is said to be a body of vocal music, including choral works, and scores for solo piano. Levina studied at the Odessa Conservatory and continued her music schooling at the Moscow Conservatory from which she graduated in piano and composition in 1932. Ten years later she completed the first of her two piano concertos. The First Concerto is an enjoyably big-hearted and fairly lengthy three-movement romantic work. It has its own character and lingua franca. Yes, there is a definite Rachmaninovian 'pitch' in the first and second movements. This announces itself unmistakably in the first minute of the first movement. The finale drifts close to both Shostakovich in the Second Piano Concerto - a work lying eighteen years in the future - and to Prokofiev. Despite some commentators referring to Beethoven and Schumann in Levina's musical affections there is nothing of their works in this concerto. I had initially wondered if there were to be any Medtner influences as there are in another Rachmaninov-inflected concerto (Dobrowen) but they too are absent. The finale has several instances where the music seems to have been influenced by Khachaturian. The compact single-movement Second Concerto was completed a year before her death. This is by no means as lush as its wartime predecessor. It is a strong piece, not difficult to approach, inventive and often touching. There is some lovely string writing in the first seven or so minutes. Its sweet core is often nostalgic, on occasion Gallic (Ravel, Poulenc) and at other times whoopingly exciting, joyous and rhythmically buoyant. 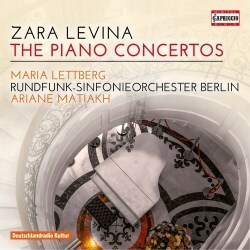 This is a very fine disc as one would expect from Riga-born, Berlin-based, Swedish pianist Maria Lettberg who with great distinction has already recorded piano works by Scriabin (review; review), Erkki Melartin (review) and Schnittke (review). Her magisterial and imaginative qualities are incessantly in evidence. As for the orchestra and the audio quality, both are up to the mark if not delivering quite the depth of plush string sound the First Concerto seems to demand. Capriccio are also to be congratulated; they have a gift for risk-taking exploration. It would be wonderful if they, together with Lettberg, were to revive Alan Bush's Piano Concerto (1937). Bush had some celebrity in the old DDR while the rest of the world for the most part passed by on the other side. Two contrasting and commanding concertos, each unusual and rewarding. Fresh adventures for enquiring minds and conspiring ears.